Though I've made some cake doughnuts from time to time, and I've made decent cake-based anko donuts, I really haven't spent much time trying to perfect the yeasted donut. I'm not sure my waistline could handle me getting it right. Come to think of it, I'm pretty sure my waistline couldn't even handle the number of trials required to approach getting it right. After being sold on some great peaches at the Pike Place Market (not local, but very flavorful), I had an impulse to make something pastry-like. I thought I might be able to make a passable peach glaze. 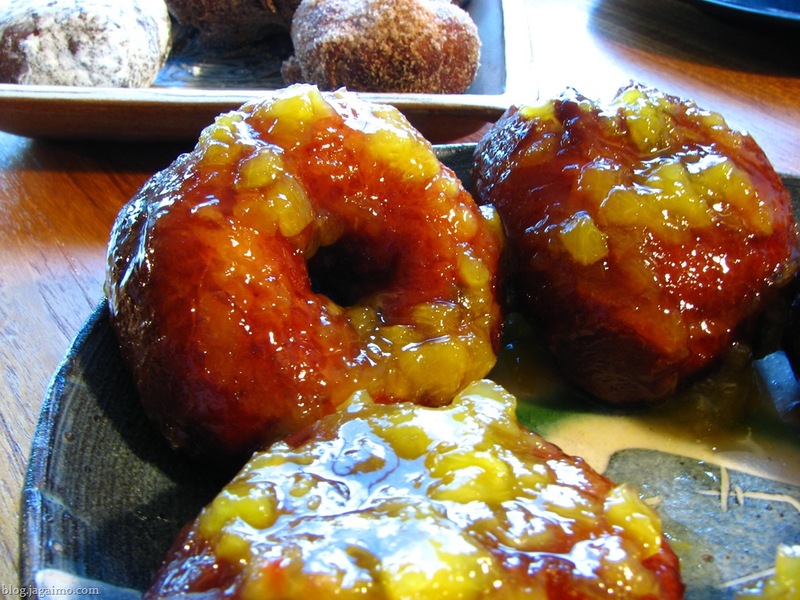 A little lemon juice, a good peach, and a heavy hand with powdered sugar, and a little amaretto liqueur cooked into a glaze: It seemed like a good idea at the time. The flavor was nice, but it turned out not to make a very good glaze, most likely due to the excessive moisture in the peaches. The texture was very filling-like, or, if used as a glaze, more suitable for something like a Danish or Brioche-based pastry. Had I the foresight to make Berliner instead of donuts with holes, this might have been the perfect use of some good peaches. My urge to be as natural as possible while minimizing the sugar content turned out to fight me with the donuts, as well. 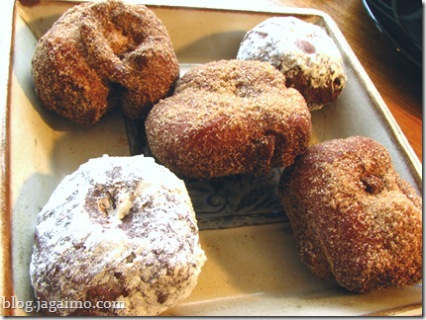 I relied on a German recipe for yeasted doughnuts that I've eyed for years in the back of a cookbook I bought ages ago, thinking that it would be far more likely to get the sugar balance close to my preference than most of the American recipes I've seen. I was right on that count, but the texture left something to be desired. The dough was a bit tough and excessively chewy. Even early on, working the dough was a bit of a fight. I should have followed my instinct and habit: normally, I don't precisely follow yeasted dough recipes, because the weather, the temperature of the water and other ingredients affect the moisture content. I always work in the flour until I get the texture I want, then add no more flour, even if the ratios don't quite match my usual recipe. Next time around, I'm going to wing the dough recipe a bit, and probably create a much moister dough, kneaded a lot more gently. I still want to keep the sugar content low, but I might add another two or three teaspoons to see if it helps the texture. I also think I'm going to need to do a bit more research on glazes.